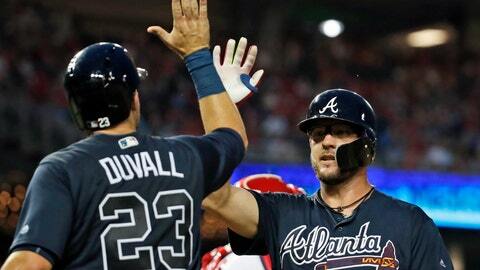 WASHINGTON (AP) — First, Braves right-hander Mike Foltynewicz worked his way out of a precarious jam. A few innings later, Ronald Acuna Jr. lent a high-rising, helping hand at the center-field wall. Combining clutch pitching, long-ball hitting and Acuna’s deft skill in the outfield, the Braves beat the Washington Nationals 8-3 Wednesday night. Foltynewicz needed 35 pitches to get out of the first inning. He gave up a double, a single and a walk and another runner reached on a throwing error — yet the Nationals scored only one unearned run and left the bases loaded. “I knew if I could limit the damage to even two runs there our offense would get some runs back,” Foltynewicz said. Bryce Harper hit his 28th home run for the Nationals, who showed their frustration in the sixth inning when rookie Juan Soto and hitting coach Kevin Long were ejected by home plate umpire Greg Gibson. Soto started jawing at Gibson before stepping into the batter’s box, sharing his opinion on a third strike call on his previous at-bat. “I never think he’s gonna toss me out. I don’t say anything wrong,” Soto contended. “That the pitch before was a ball. Make sure he can understand and be better. Help him help us,” Soto said. That wasn’t the only thing that angered Martinez. Foltynewicz (9-7) allowed three runs, one earned, in 5 2/3 innings. He’s 3-2 in five starts against Washington this season. Braves: Anibel Sanchez (6-3, 2.89 ERA) pitches the series finale Thursday afternoon. He’s 10-1 with a 2.11 ERA lifetime against Washington.